Shop Vases at RedViolet. We deliver through out Nigeria. Browse our other selection of Furnishing Accessories such as Decorative Plates, Wall Arts, Throw Pillows, Cushions and more! This Decorative Vintage Style Cream Floor Vase makes for a stunning home. It can also be used as a t.. This Decorative Vintage Style Cream Floor Vase makes for a home with an exceptionally beautiful look.. This Biege Mottled Textured Bullet Vase has a very unusual 2 tone colouring in light cream and biege.. The Black and Bronze Table Vase 40cm is a long- necked decorative vase that can be coordinated with .. The Black and Bronze Table Vase 49cm is a long neck decorative vase that can be coordinated with 2 o.. The Black and Gold Mosaic Shimmered Vase 55cm is a statement long decorative vase with a narrow neck.. This Decorative Black and Gold Mosaic Shimmered Vase 66cm is a statement long decorative vase with a.. The Rough Textured Black and Grey Bullet Vase is a contemporary piece. This vase is ideal for an exc..
Blue Glazed Metalic Vase is a smoked vase, suitable for that space. This penetrating blue gaze .. The Blue Mosaic Tile Vase 66cm is a statement long decorative vase with a narrow neck, suitable for .. The Blue Mosaic Tile Vase is a statement long vase with a narrow neck, suitable for classy home inte.. 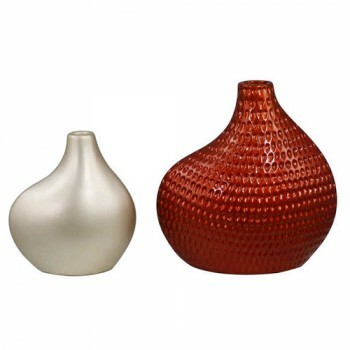 The Bronze Cracked Effect Vase 44cm has a slender shape with lines at the top surface suitable for b.. The Bronze Crackled Effect Vase 36cm has a slender shape with lines at the top surface, it is suitab.. The Decorative Bronze Hole Bottle Vase is a contemporary sculptured vase suitable for stunning home ..